I am so excited to be a part of the My Monthly Hero Blog Hop this month! Hero Arts is one of my favorite companies so designing with the My Monthly Hero Kits is always an honor! This month's kit was so much fun to work with that I have FOUR cards to share......let's get started! 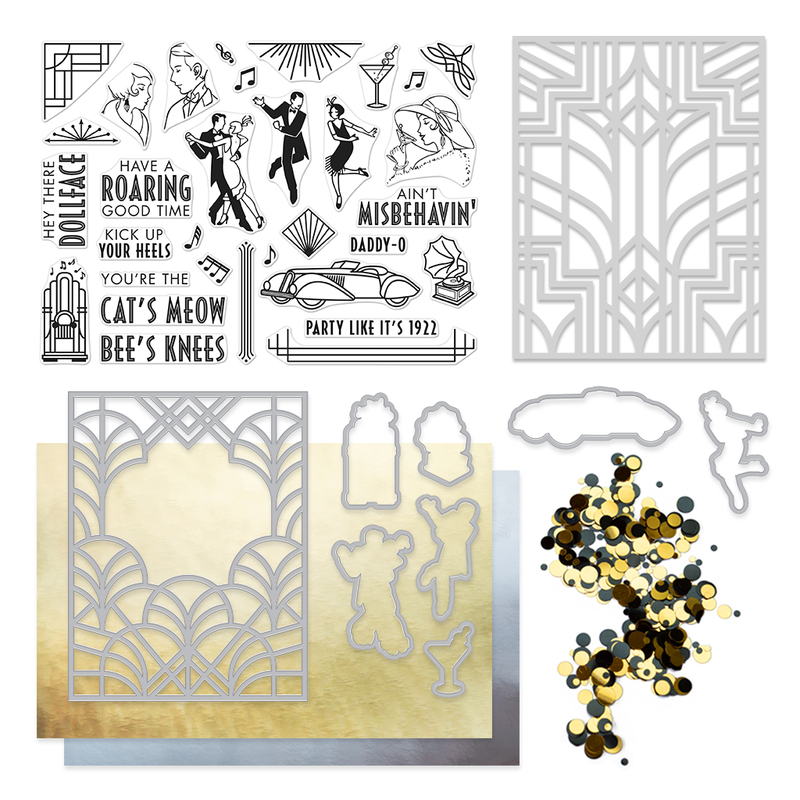 This month's kit takes us back to the Roaring 20's but don't let it fool you! There are so many options for designs from this kit......I had so many ideas but not enough time! The kit is available for a limited time only - once it's gone, it's gone. Kits begin shipping from Hero Arts on Friday, February 8. You can now subscribe to receive the kit monthly and never miss one! The kit value is over $70......but only costs $34.99. Once this kit is gone, it's gone! Get all the February Add-ons HERE! Let's start off with the core kit. Here I've used some stamp elements from the main set and gold heat embossed them onto a white panel. To the red panel, I ink blended Delicata Golden Glitz with a blending brush (the ones I recommended and that you can find on my LinkTree on Instagram). I added it heavily to the perimeter of the panel as the center will be covered up. Once done, the gold embossed sentiment panel was added with foam adhesive. Done! My second card also uses the core kit in more of what it was designed for......the Roaring 20's! 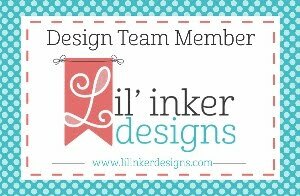 I created a shaker card using the A2 Fancy Die that is included in the kit. The A2 Fancy Die was done in gold cardstock and layered over a black panel that the "window" was hand trimmed out to make the shaker. I filled the shaker with the black/gold confetti that also comes with the kit. To the front of the card, I added the stamped man and woman dancing with foam adhesive over the shaker portion of the card. For a sentiment, it was white heat embossed onto a black panel of cardstock and adhered to ground my images. Moving onto more traditional ways to use the kit and some of the fabulous Add-Ons. 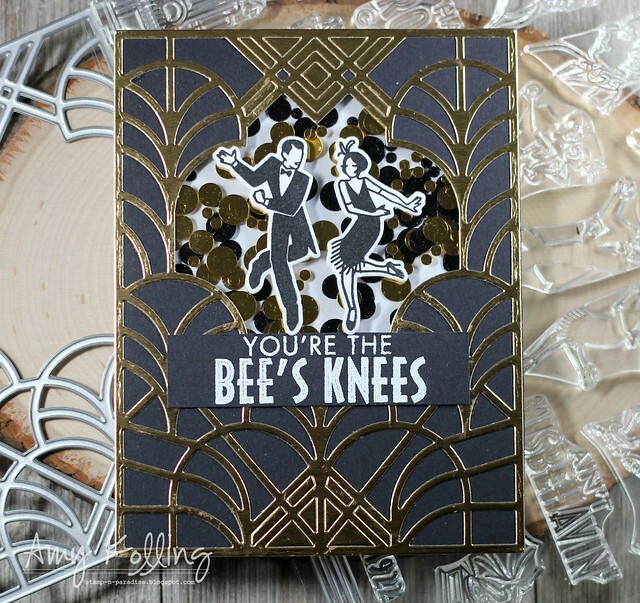 This card uses lots of white space using the Ballroom Window Fancy Die. I added my window panel with foam adhesive over a white notecard that was ink blended with Broken China Distress Ink in ombre fashion. My butterfly is from Deco-rations (a new add-on set) and was black heat embossed. I lightly flicked shades of pink Copic over it's wings. Once done, the image was die cut using the coordinating dies and added to my window with foam adhesive. For a sentiment, I used a small but gorgeous sentiment from the new set, Diamond in the Ruff on a thin white sentiment strip. A few blue gems were added for shine. For my last card, I knew I wanted to stamp a panel in rainbow color with this image from Deco Celebration. Using inks from my stash, I inked the image and stamped it on the angle in rainbow order. For the sentiment (Deco-rations), it was white heat embossed onto a black cardstock strip and cut into a banner. The banner was added with foam adhesive and gems for more sparkle and shine! 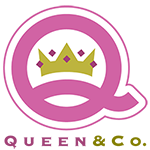 What's a blog hop without a giveaway? We are giving away one kit to one blog reader - selected from the comments across all of the blogs in the hop. Giveaway closes Sunday, February 10 at 11:59pm EST, and the winner will be announced the following week on the Hero Arts Blog. Hero Arts will reimburse if the winner already bought the kit! 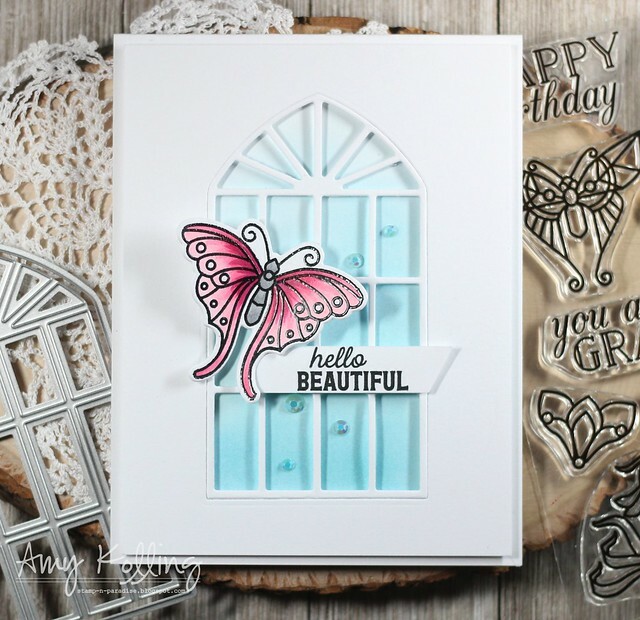 beautiful work, Amy - love your butterfly add on card!! These are all great! The Bees Kness Card made me smile! They're all so classy and fun!! Love that shaker!! What a great kit! Love all 4 of your cards! Great job! Such variety with your cards. Love that you used some of the art deco elements for cards that do not have an art deco feel. I really liked all of your designs. Wow! Each card shows the versatility of these products! TFS! Wow, what gorgeous cards! I love this kit! My favorite is your Bees Knees creation. Fabulous!! Your cards look amazing! I especially love your shaker card! What a good idea--to make a shaker. I can almost see the balloons falling. Love your cards! My favorite is the colorful birthday. It shows the versatility of the set. Really beautiful cards! You really showed the versatility of the kit. Thanks for sharing. I love the shaker card. It goes perfectly with the dancers in front and full of energy and excitement. What a great set of fun and pretty cards. 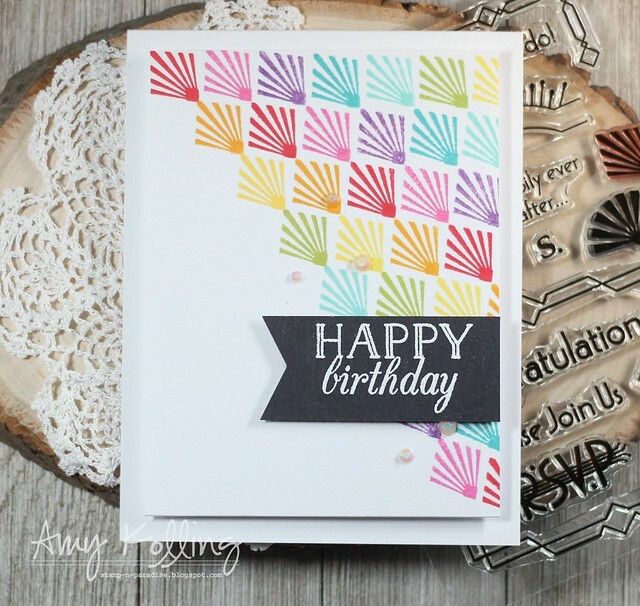 Love that you used such a variety of products from the new kit; especially like the way you turned that one little Deco-Celebration image into a beautiful, colorful background for your birthday card. Lovely! Thanks for sharing such beautiful inspiration with this kit's contents. 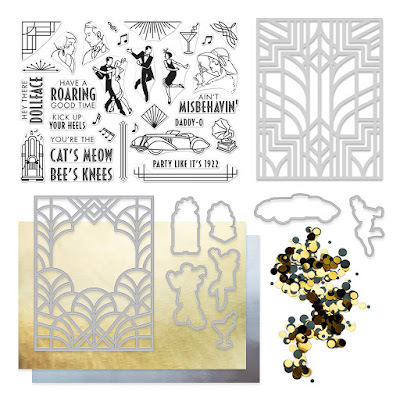 Love Art Deco and this fab kit! Your shaker card is gorgeous! I also liked how you used one of design elements in the different colors to create a very unique card. All of these are lovely. Great choice to make a shaker card, since they really shook things up in the 20's! Love the colorful designs, too! Wow! Your cards are great! What an amazing kit! I especially like the shaker card! Thanks for sharing your ideas. Oh, you have been busy, but I can understand why. This Release Kit is my all time favourite & my mind is busy with ideas, which I don't usually have to tell you the truth. You've showcased this release in such a wonderful way, using both the kit & some of the add-ons. I absolutely love the red & gold background on the first card. I love seeing items showing th add one. The cards you created are beautiful and fun. Oh my your shaker card is wonderful!!! I love your unique idea!!! and the colors!!! These are all beautiful! I think my favorite is the colorful birthday card at the end. Great ideas on all of them. All of your cards are so different, I love that! I love the subtle gold on the red background of the first card, but all are awesome. You made 4 fabulous cards. Love the rainbow colored card. Thank you for sharing and the opportunity! Great cards and colors - love this kit! Your shaker card is my favorite. I just love the black and gold combo. Beautiful cards and great HA kit! TFS! Each one of your cards are so unique and beautiful. I like the shaker card that seems to make the dancing couple come alive. Love your cards! So creative! The shaker card is beautiful! Fantastic collection of cards, adore the butterfly one & the happy colours on the last card. Thank you for sharing so much variety. You sure had fun and inspiration with this kit...fabulous thanks for sharing. Love your cards! I love seeing something different than just the gold and black. Glad this set is so versatile! I am in love with the kit and all of the wonderful ideas! Love the colors and the shaker! Great cards! 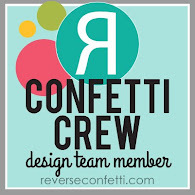 Oh my, love all the cards in this blog hop, can’t wait to get my kit to start creating. WOW! stunning! All of them, but my two favs are the shaker and the birthday card. I never would have thought to use that stamp for a birthday card. Thank you so much for inspiring me. such a wonderful array of cards you've created with this fantastic new kit! Beautiful creations! Love this kit! I really loved your shaker card. Very beautiful and elegant. thanks for sharing and being such an inspiration. Amazing cards! Love the shaker! So fabulous the cards and the release! This hop is a blast! Such great cards! Thank you for sharing all the many different ways to use this kit! I really like the ballroom window card and the airiness of the rainbow birthday card. It’s a welcome change from all the black and gold. Great variety - love the butterfly/window card. Very pretty. I love the shaker card - it is stunning and very festive. Great way to apply these kit elements. 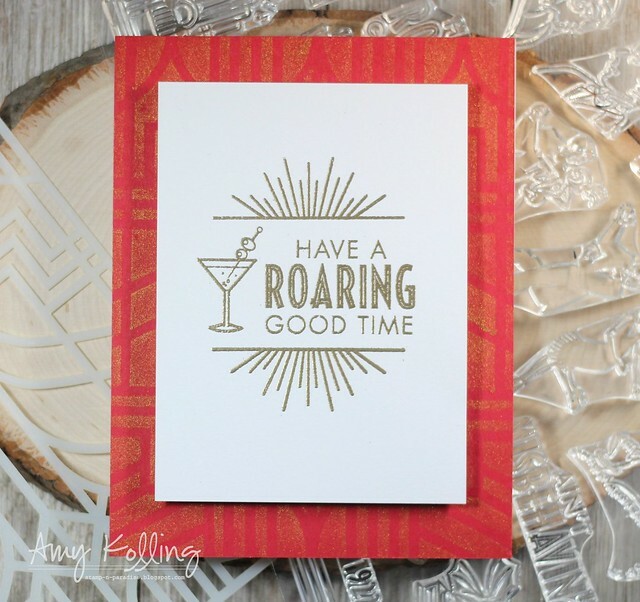 Fun to see one that breaks out of the traditional Art Deco design on your rainbow card! Thanks for the fun ideas! Gorgeous cards! I love the one with the butterfly. Beautiful and creative cards. I really like these! Gorgeous set of cards. Love the versatility of this kit. Not crazy about this kit but the ladies still did some very neat projects with it! I really like your backgrounds! love the use of color in the last 2 cards posted. Awesome new Kit, I love the Art Deco style! Gorgeous creations! I especially love the shaker card with the Shaking it up couple! Your cards look great! I love that Shaker card. They are one of my favorite kind to make. I'll have to try it if I get my kit before it's gone. Great work Amy! I like your cards, they are different and colorful which is a nice take on the kit. Thanks so much busy lady! Wow! I love all of your gorgeous cards! Especially the shaker card! Thanks for all the great inspiration! I am excited about the potential this kit offers to make cards for so many occasions. Inspiring! 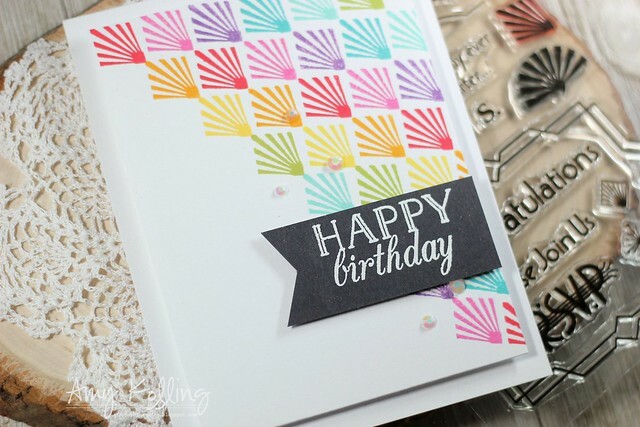 I really love the rainbow card you created using just one simple stamp motif! Very creative cards you have made with this kit. Love the variety of cards you’ve made! I was hoping someone would use that confetti for a shaker card! It looks fabulous. 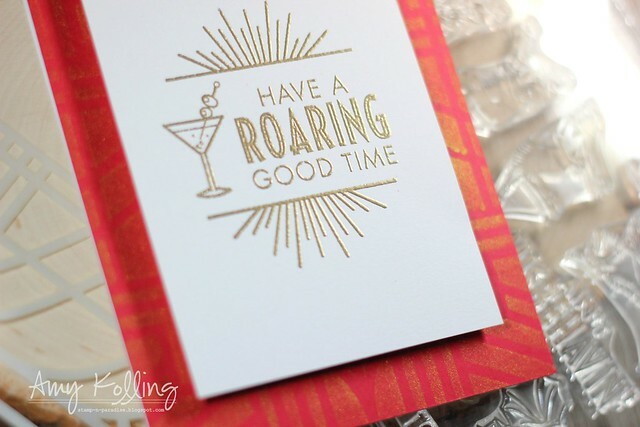 Stunning, fun and fabulous cards! What wonderful designs and inspiration! A wonderful set of cards Amy! Such clever use of the great elements in this release! Thanks so much for sharing your wonderful inspiration! Wonderful kit and cards! 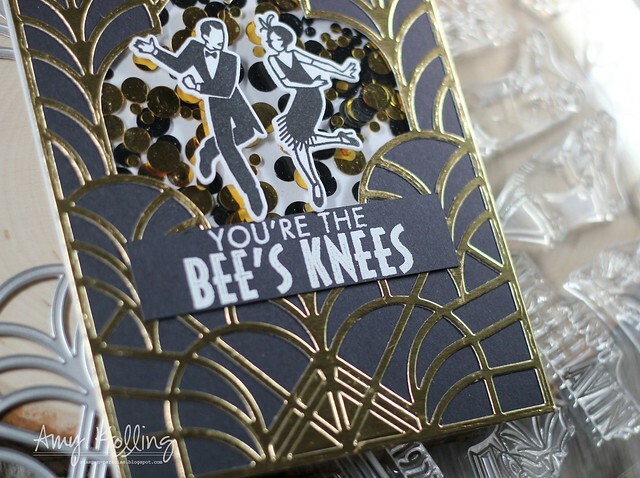 Especially love your pretty black and gold shaker card! Thanks for shariing! Amazing cards! I love your shaker card! The butterfly card is just so pretty. I love the background with the pink butterfly.